Earth Day was founded in 1970 to promote respect for life on the planet as well as to encourage awareness threats to that life, especially pollution. 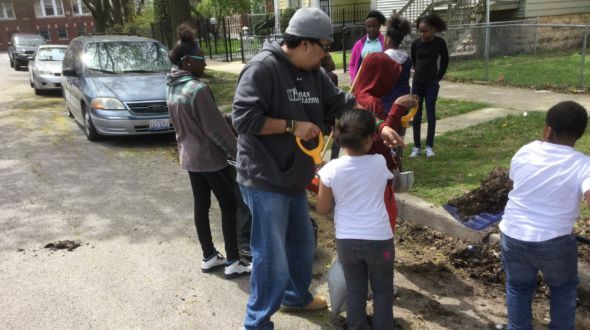 Advocates usually celebrate on April 22nd with outdoor performances and acts of service to environment including planting trees, picking up roadside trash, conducting various programs for recycling and conservation. In an effort to increase communication and support with different organizations in the Englewood community, Coach Will attended a “village meeting” sponsored by the Resident Association of Greater Englewood, or RAGE, whose mission is to organize people and resources to force a change in the Englewood community. RAGE organized “The Greater Englewood Unity Day,” an event connected with Chicago’s Citywide Clean and Green Volunteer Clean Up. 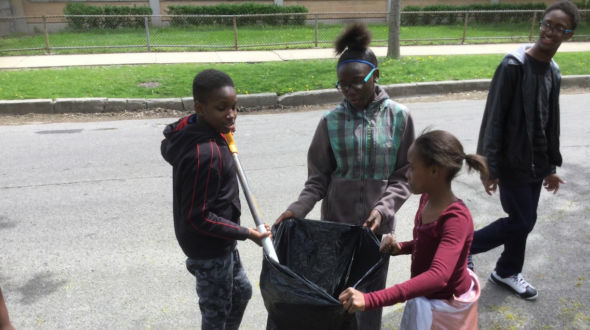 In keeping with the amazing improvements that King Academy of Social Justice and Urban Initiatives are making within the neighborhood, Coach Will organized a cleanup day with students from King as part of that larger effort. 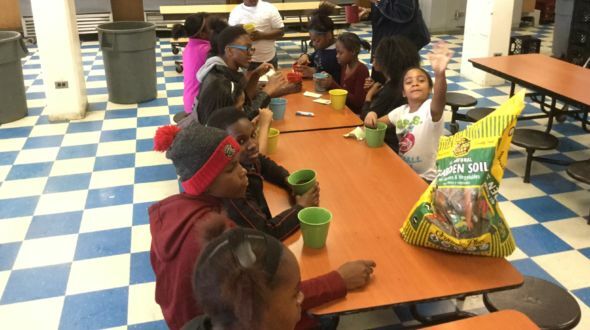 This school year Urban Initiatives’ partnership with King Academy is made possible through a grant given by the Nike Community Impact Fund and the South Chicago Nike Community Store. 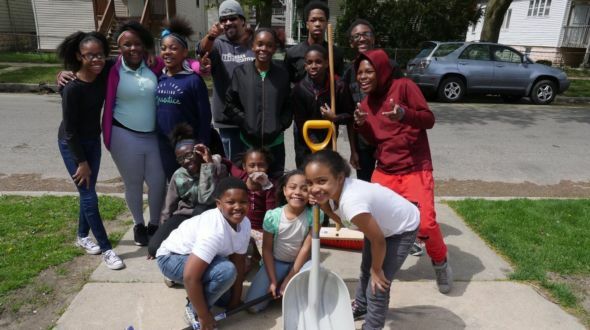 Coach Will organized a group to volunteer and held conversations with students about the meaning and importance of Earth Day, and the difference they can make in their own neighborhood just by helping to clean it up. With assistance from the 17th Ward in the form of clean up tools, such as rakes, shovels, brooms, and bags, the King crew was ready to go. 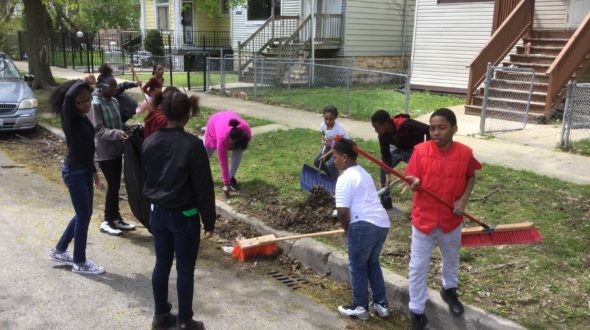 Arriving early on a Saturday, more than 20 students showed up to clean up their neighborhood. It was an amazing spectacle. Listening to these students chanting “#MakeAChange” expressing how proud they felt about their efforts and witnessing them being able to work together for a joint cause was a sight to see. This day was much more than cleaning up our community. This day was about joining forces and showing the difference we can make TOGETHER! These students who took advantage of this opportunity and showed up on this Earth Day are on the way to become tomorrow’s leaders.